PHILIPPINES, MEET YOUR 4TH MISS UNIVERSE! - I Blog, Therefore I Am. PHILIPPINES, MEET YOUR 4TH MISS UNIVERSE! I'm claiming it as early as now: The Philippines will get its 4th Miss Universe crown this 2018! Latinas, beware! You've been warned. Divine intervention, experience, beauty, and intelligence all collaborated last Sunday for Miss Catriona Elisa Gray to be our 2018 Miss Universe Philippines! Everything just fell into place. She was the clear winner from the get-go and she delivered well - just like her Miss World Philippines competition back in 2016. Catriona nailed most of her presentations last Sunday. Nobody is as consistent as she was. Some of the frontrunners even faltered in some of the segments. My favorite is Cat's Evening Gown presentation. The gown was made for international pageants (Made by Mak Tumang. Ang ganda! ), the added touch of her 3 stars and a sun earrings was superb, and her parasela was all-drama and fierce. It was mostly game over after that. Cat got 5 out of the 11 Special Awards including BOTH the guaranteed-of-a-crown Best in Evening Gown and Best in Swimsuit. I was quite surprised with the latter and we all know that this is the one little area that Cat must focus on prior to Miss Universe 2018. Pageant history books will write Cat as the first ever Filipina who is a double winner of the two major crowns in the country. She earned the right to represent us in Miss World (2016) and Miss Universe (2018). What a transformation - from sweet to fierce! Pageant experience is now one of the main considerations for a crown. Gone are the days of raw first-time winners especially for the two top crowns. 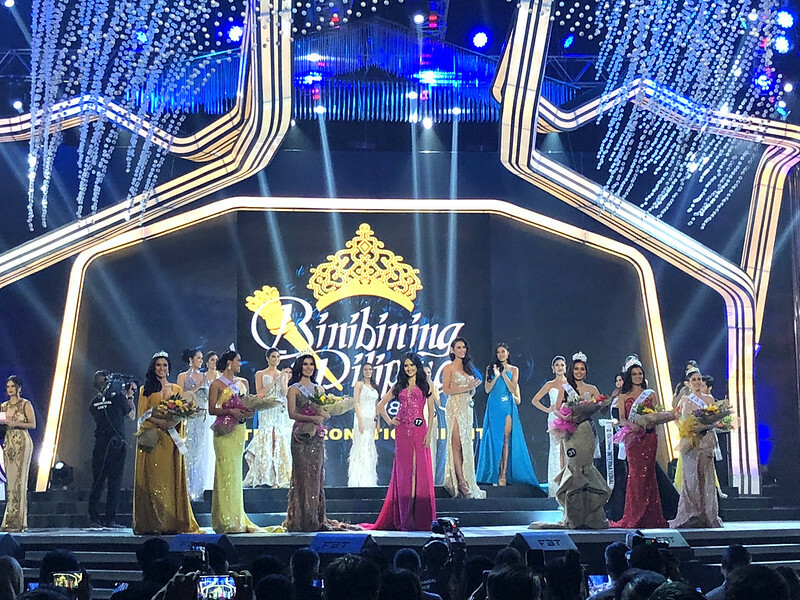 Almost all the Miss Universe Philippines and Binibining Pilipinas International winners since MJ Lastimosa (who started this trend) with the exception of Maxine Medina and Bianca Guidotti were all repeaters, cross-overs, runners-up, and winners of other pageants. 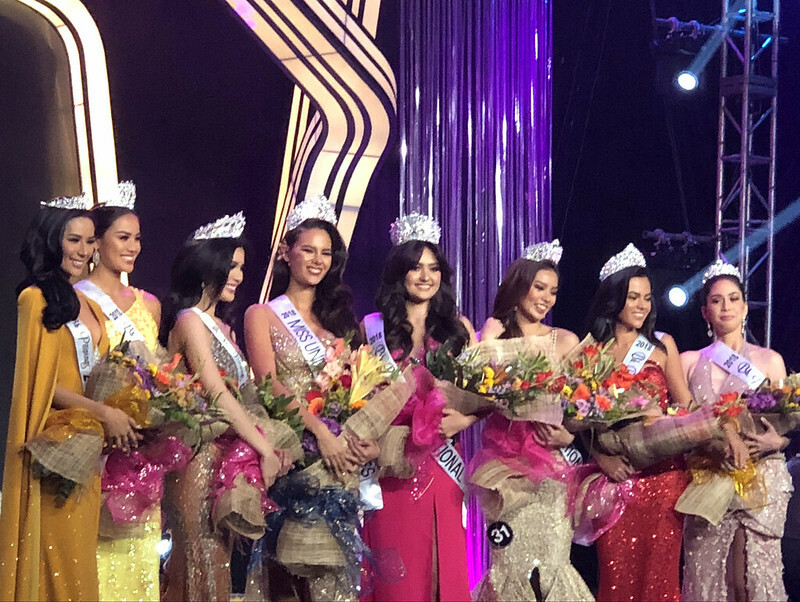 Thus it's not so surprising that Jehza Huelar, Eva Patalinjug, and Karen Gallman got their placements and crowns for Supranational, Grand International, and Intercontinental respectively. This was also probably the reason why heavy-favorite Michele Gumabao had to settle for the Globe crown. Over-all pageant experience held Michele's quest. I would've wanted a greater crown for her but she was fairly outperformed by Jehza and Eva. I would've given her an Intercontinental crown at least. It was quite a surprise to see Karen Gallman finishing strong after she "kinda" bombed the Q&A. We were all expecting just a runner-up finish for her (at the most) because her answer fell short but I guess over-all performance was also considered. She started really strong but ended flat. Her saving face was her super gorgeous Evening Gown presentation that left me in awe. A lot of people feels that this crown should've been Vickie Rushton or Wynonah Buot's based on over-all performance especially in the Q&A. The luckiest winner for me is Ahtisa Manalo. This defying-the-odds first timer (she had some Festival Queen experience though) fresh-faced beauty is the Barbie DOLL FACE who clinched the Binibinibing Pilipinas International crown. I mentioned on my last blog the absence of a "strong" adorable doll face whom we can send to Japan. I took note of Ahthisa, Eva, and Vickie as possible winners and considerations. All three amazingly delivered and I was convinced minutes before the coronation that Eva should get the second top plum. BUT a quick Google also revealed that beautiful Ahtisa not only has the doll face but also the height that might bring us our 7th Miss International crown. Ahtisa like Bea Rose Santiago and Kylie Versoza stands 5'9" with that required adorable doll face to boot. Thus Eva was logically sent to Miss Grand International where speaking and Q&A is a huge deal. We need a win there and I believe that Eva is the right queen for the job. Vickie Rushton and Samantha Bernardo - both answered well and both were from KF - settled for runners-up position this year. Karen Gallman's crown should've been Vickie's. But not everything is lost since Vickie can still join next year. As for Sam...I'm calling it as early as now and say that Sam Bernardo can be THE future. She can easily be a Miss Universe Philippines IF she plays her cards well in the 12 months. This girl got the goods. Sandra Lemonon MAJORLY bombed her Q&A on Build, Build, Build but she rose above it and would definitely join again next year. Placers and runners-ups like Vickie, Sam, and Wynona should also join again next year for possible crowns. All hail the Queens! Exciting times!